That day, on 23 April, according to tradition couples exchange gifts: a book for the men and a rose for the women. Roses have been associated with this day since medieval times, but the giving of books is a more recent tradition originating in 1923, when a bookseller started to promote the holiday as a way to commemorate the nearly simultaneous deaths of Miguel Cervantes and William Shakespeare on 23 April 1616. Book and flower stalls are set up along the streets of Barcelona. The main meeting point in Barcelona is the Rambla, which is packed from end to end with book and flower stalls. You will be able to find the latest publications, see well-known artists signing copies of their books, and of course, smell the scent of the roses. By the end of the day, some six million roses and 800,000 books will have been purchased. 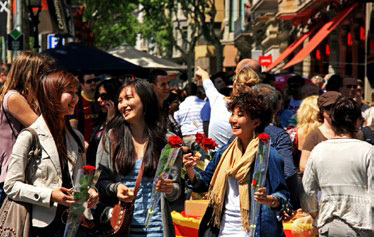 Most women will carry a rose in hand, and half of the total yearly book sales in Catalonia take place on this occasion. The sardana, the national dance of Catalonia, is performed throughout the day in the Plaça Sant Jaume in Barcelona. Many book stores and cafes host readings by authors (including 24-hour marathon readings of different classics of Catalan literature or Spanish literature). Street performers and musicians in public squares add to the day's atmosphere. 23 April is also one of only three days a year when the Palau de la Generalitat, Barcelona's principal government building, is open to the public. The interior is decorated with roses to honour Saint George. Catalonia exported its tradition of the book and the rose to the rest of the world. In 1995, UNESCO adopted 23 April as World Book Day. From Barcelona Premium, we invite you to come to Barcelona and experience, first hand, this amazing day.